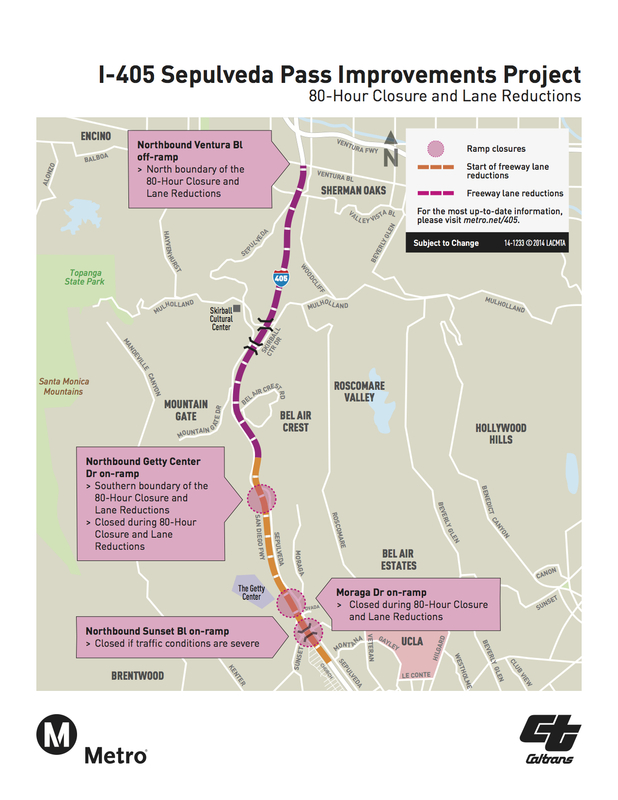 Lane closures begin late Friday evening and a complete closure of the NORTHBOUND 405 will be achieved by 1 a.m. from Getty Center Drive to Ventura Boulevard. Only two northbound lanes will be open during daylight hours on Saturday, Sunday and Monday and a 65 percent reduction in traffic is needed to avoid serious gridlock. MOTORISTS ARE ASKED TO AVOID THE AREA IF POSSIBLE!!!! 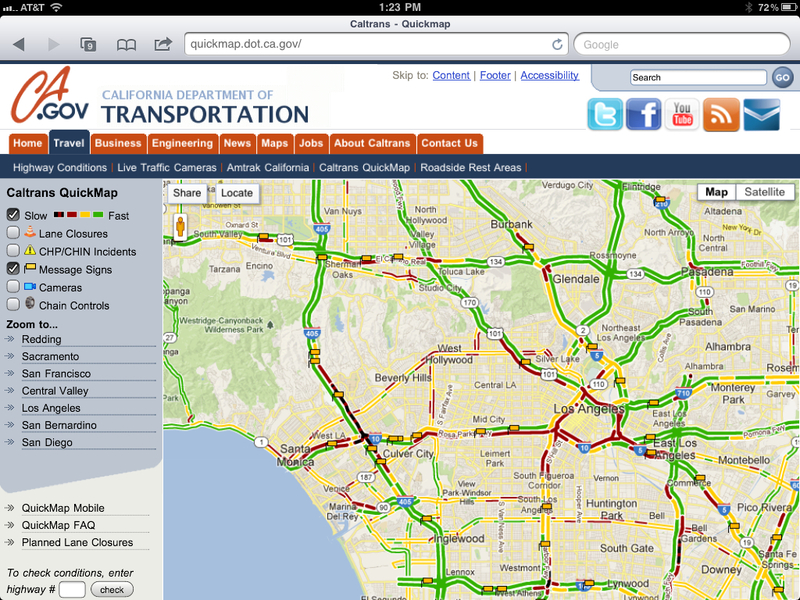 ESPECIALLY DURING THE DAY WHEN THE NORTHBOUND 405’S CAPACITY WILL BE LESS THAN HALF AS USUAL!!!! 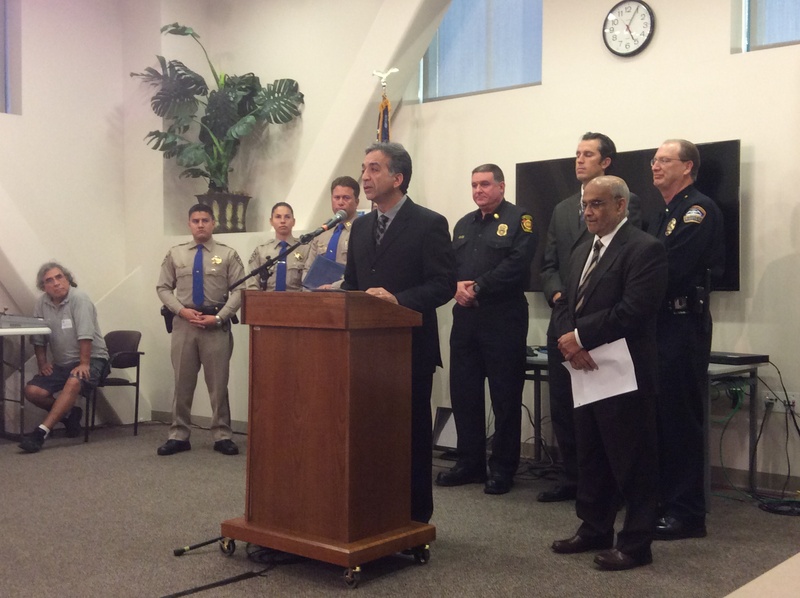 Officials again asked the public to avoid the 405 and Sepulveda Pass area this weekend at a news conference Friday afternoon at Caltrans’ Traffic Management Center. Photo by Dave Sotero/Metro. The 80-hour lane closures — which end Tuesday morning — are being done for repaving work on the northbound side of the freeway. 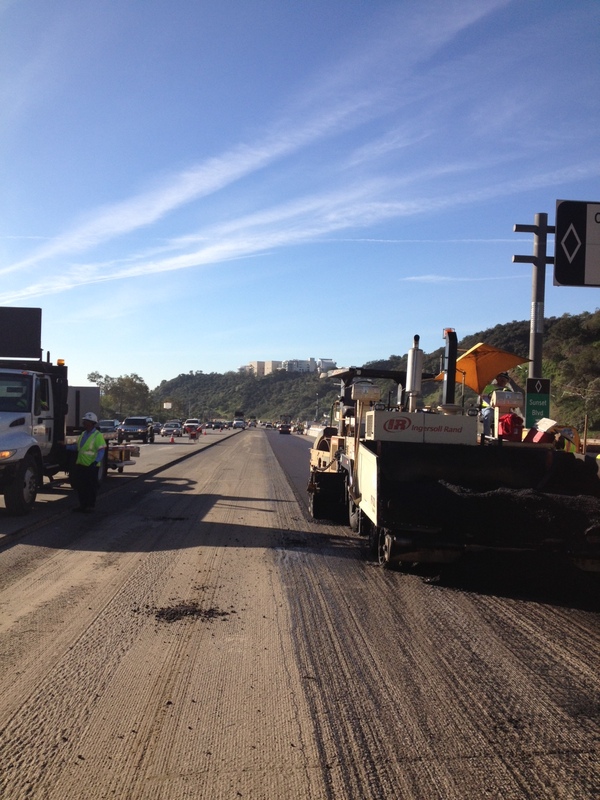 Most of the work until now has been on the sides of the freeways, on the freeway ramps or the bridges above the 405. This work is being done on the freeway itself and is necessary to complete the project — which is expected to be done by this summer. The I-405 Sepulveda Pass Improvements Project is adding a northbound HOV lane between the Santa Monica Freeway (I-10) and the Ventura Freeway (I-101). The southbound 405 already has an HOV lane. When completed, the 405 will have HOV lanes in both directions from the northern San Fernando Valley to the Orange County line (click here to see a map of HOV lanes in L.A. County). The traffic maps and photo at the top of this post are from Saturday, March 2 of 2013 — a day when three lanes on the northbound I-405 were closed between Montana Avenue and the Getty Center off-ramp for construction work on the 405 northbound carpool lane project. 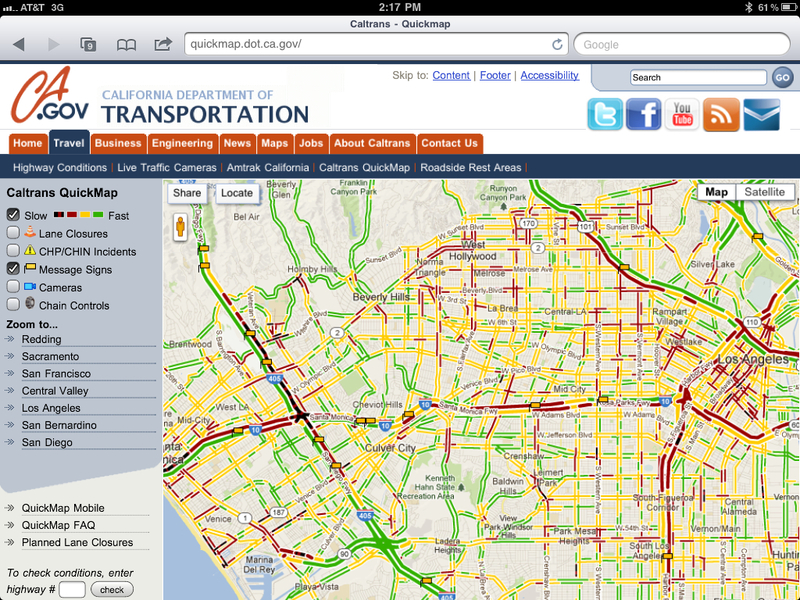 While traffic in L.A. is usually a bear on Saturdays, it was especially grizzly on that Saturday. The problem, in short: not enough motorists heeded warnings to avoid the northbound 405, thereby backing up traffic to Marina del Rey by 2 p.m. and well beyond later in the day. Thus, the reason Metro is harping on the upcoming Jamzilla northbound lane closures that begin late Friday night and run until Tuesday morning. The message, again and sweet and short: please avoid driving on the northbound 405 over the Sepulveda Pass this upcoming weekend. Jamzilla video: who you gonna call?